As one of America’s foremost inventors, Thomas Edison was certainly adept at questioning the world around him. In order to better understand the natural world, Edison was constantly developing new context by asking different questions. And the framework for formulating these challenging questions? I didn’t read books – I read the library. Among Edison’s first steps when undertaking a new collaborative effort was zeroing in on reading material with themes aligned to the subject matter he was evaluating. This often meant plowing through textbooks and papers spanning diverse scientific topics. But he also read fiction and fantastical works that were completely unrelated to the subject of his endeavors. Edison believed feeding his mind diverse perspectives through the written word was critical to prevent specifically shaping or tainting his perceptions in any one direction as he began his questioning process. An ardent lover of books and newspapers, by 1887, when Edison was 40, his personal collection at his laboratory exceeded 10,000 volumes. Though seemingly small by today’s standards, it was one of the top five libraries in the world during the late nineteenth century. Drawn from the reaches of acoustics, botany, electricity, mathematics, photography, chemistry, materials sciences, and physics, Edison shared the resources of his library with his employees, encouraging them to continually stimulate their own thinking and questioning skills. Reflecting on his love for storytelling and the deft use of language, Edison’s library also embraced extensive works of classical Greek literature plus a vast collection of Shakespeare. He particularly valued science fiction novels by pioneering French writer Jules Verne for the flights of fantasy and freedom from logic they spurred. We can link Edison’s reading to many of the provocative questions he asked. Diligently recording his queries and insights in the notebooks that were ever-present at his side, Edison returned to these deep, probing questions again and again. His intentional gathering of questions became a pivotal spur for experiments and hypotheses that he later introduced when working jointly with his team. Just as Edison’s hours of reading in his library sparked questions to be pursued via new hypotheses and experiments, your own reading endeavors can yield serendipitous yet brilliant questions from angles you least expect. When was the last time you reached for a new hardcover book or bought an e-book? How frequently do you change the types of materials you read? Do you follow the same reading routine over and over again? Why not experiment and select three new bloggers to track over the next month? Why not take a reading retreat? If you were to shift your reading list so that it looks something Edison might devise, what would be on it? Is It True Collaboration… or Is It a Team? At Auxano, we practice what we preach. Our primary tool for working with organizations is the Vision Frame, consisting of Mission, Values, Strategy, Measures, and Vision Proper. Before we led the first client through the process over 11 years ago, the original team of Will Mancini, Jim Randall, and Cheryl Marting worked out Auxano’s Vision Frame – which we still follow today. One of our Values is Collaborative Genius, which is accomplished partly by the fact that we are a virtual company of over 20 team members living in 15 cities across 4 time zones. I only thought I knew what collaboration meant! In my adult work career, I have served as the accountant in an office setting for a food services company, an audiovisual technician as part of a team of 7 for a seminary, various roles on 3 church staff teams, a church consultant for a design-build company, and as the Vision Room Curator for Auxano. That’s 36+ years in an environment of multiple team members, ostensibly working together for the good of the organization. Was I collaborating with others, or merely part of a team? At Auxano, we don’t just do our part, we collaborate to deliver excellence in all we do. Here’s a great example: our book summaries for leaders, called SUMS Remix. Beginning in the fall of 2012, every two weeks, a SUMS was distributed to the SUMS subscriber list. Practically every day of that two weeks, some of the actions above were taking place within our team as we work on multiple books at the same time. As we neared the end of our second year of SUMS, Will and I refined a concept that came to be called SUMS Remix. Instead of a single summary of one book, SUMS Remix consists of brief excerpts from three books, focused on providing simple solutions to a common problem statement that ministry leaders are facing every week in their churches. SUMS Remix launched in November of 2014, and we release an issue every two weeks. And a similar collaboration process described above is still taking place. The collaboration process for SUMS Remix is very similar to the one above, but on steroids! Because SUMS Remix involves 3 books for every issue, and we have a 5 week production cycle, and we release an issue every two weeks – well, without collaboration, it just wouldn’t – no, couldn’t – happen. At any given time during that 5-week cycle, books are being read, notes are being taken, drafts are being written, drafts are being revised, additional research is being conducted, finished drafts are being designed, proofs are being reviewed, and the final SUMS Remix issue is being delivered. Want to see the end product of that collaboration? You can learn more about SUMS Remix here. Do these qualities sound different from the ones valued by your team? Do they draw upon ideas that feel new or seem broader than your current concept of what teamwork embraces? Based on my experience, the answer would be yes. No organization is immune to the shifts set in motion by current global tides. Its ripple effects have shaken the very foundations of how business is being conducted today, continually reshaping our view of how leaders, teams, and customers react. Our core challenge is to acknowledge where and how to embrace true collaboration as the centerpiece of this new ecosystem. Thomas Edison knew this in the late 1800’s. 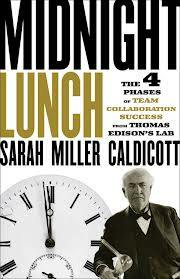 Sarah Miller Caldicott, great grandniece of Thomas Edison and author of the book Midnight Lunch, believes that the notion of a collaboration ecosystem linking innovation, strategy, and value creation stood at the heart of Edison’s laboratories as well as his manufacturing empire. Caldicott believes that there are three major forces to be aware of in designing an effective approach to collaboration today: complexity, metalogue, and reskilling. The Rise in Complexity Due to Massive Generation of Data and Real-Time Synthesis: The accelerated pace of technological change has erased familiar industry boundaries, opening the way for rapid formation of new markets. A tsunami of data can now be consumed – and generated –by individuals armed with mobile phones and other smart devices. Although operating in a different technological era, Edison embraced complexity as a fundamental component of collaboration itself. Embracing complexity rather than sidestepping it represent a hallmark of Edison’s true collaboration process. The Rise of Metalogue as a Tool for Creating Purpose and Connection: Feelings of fragmentation yielded by economic and technological shifts have depended the need for connection and common purpose across large groups of people. Communities, organizations, and governments face an imperative to hear the opinions of diverse constituencies that now can generate influence outside of traditionally recognized channels of decision-making or authority. Edison’s true collaboration process recognizes the central role of collegiality and team discipline as crucial components that lay the groundwork for dialogue – and ultimately, metalogue. He maintained a high level of team coherence even when pressures mounted by grounding his teams with an understanding of how debate and conflict could be constructively harnessed. The Need for Reskilling Workers in the Innovation Age: The broad availability of smart devices paces new emphasis on what people can potentially create rather than what they already know. Skills linked to knowledge sharing, such as effective communication, adaptive thinking, and cross-generational leadership, are gaining new prominence in realms where functional expertise formerly dominated. Edison’s four phases of collaboration offer a unique platform for embedding collaboration as a superskill in your organization using discovery learning and hands-on engagement rather than tired classroom-style approaches. Instead of pushing lectures to teach creativity and problem solving, Edison’s experiential approach engages the reskilling process by activating creative centers of the brain and thereby developing large neural networks that drive learning more deeply than task-based or fact-based approaches. The underlying mechanisms of Edison’s true collaboration process are a crucial priority for every organization. Organizations that engage true collaboration as a backbone for their innovation, value creation, and team development will remain thriving and nimble in the face of constantly shifting economic and cultural forces. Collaboration is not just a nostalgic look into the past or a hoped-for future aspiration – it is a necessary organizational survival skill needed now. Authors Michael Gelb and Sarah Miller Caldicott, writing in Innovate Like Edison, call this approach super-value creation. Once he had gathered information about openings in the market and the needs of the consumer, Edison analyzed how his observations meshed with what his laboratories could deliver – or could learn to deliver. He then calculated how much it would cost to go after the market –or markets – he had in mind, creating an innovation plan including commercialization options. Finally, he placed the finish touch on his products: the mystique of the Edison brand name. Edison was a master at anticipating trends and spotting gaps in the marketplace. His approach used both analytical and intuitive tools to help determine market size and the best target audience. Thomas Edison drew customers to his products with sophisticated branding techniques plus a wide array of media and communication tools. Using Edison’s ideas of super-value creation as your guide, you can learn how to design a business model that is best suited for your ideas, or for your organization and its innovation endeavors. Read on overview of Edison’s Five Competencies for Innovation here. What happens when you combine the talents of a British textile merchant, a Swiss watchmaker, an American mathematician with a master’s degree in physics, an Irish electrician, a German glassblower, and African-American electrical engineer, and a partially deaf telegrapher? For Thomas Edison, the result was a world-beating team of collaborators who churned out hundreds of commercially viable patents and products. Although Edison was an incomparably brilliant independent innovator, he understood and valued the importance of working with others. He knew he needed a trustworthy team of collaborative employees who cold illuminate his blind spots and complement his talents. The word “collaboration” comes from the Latin root collaborare, meaning “to labor together, especially intellectually.” The term “master-mind” was introduced by success expert Napoleon Hill to refer to a very high level of collaboration. He defined it as a “coordination of knowledge and effort in a spirit of harmony, between two or more people, for the attainment of a definite purpose.” Hill emphasized that when people come together with their passions aligned with common goals, they can multiply their individual intelligence in an expanding framework of positive, creative energy. Hill witnessed the living expression of this idea in the laboratories of Thomas Edison. Contemporary sociological and psychological studies demonstrate consistently that the collaborative, open model developed by Edison optimizes the confluence of creativity, strategy, and action. Edison’s approach to master-mind collaboration allowed his teams to be exceptionally productive in generating, developing, and testing his innovations. Edison always understood, however, that the ultimate purpose of all their efforts was to crate exceptional value for their customers.